An innkeeper sits before nine cups set out for guests. This is considered one of the best cards of the minors, the "wish" card. Keep in mind, however, that this card is not Aladdin's magic lantern granting you that new car or winning lottery number. It is about our wish for emotional fulfillment. In some mystical systems it's thought that what you put out will return back to you threefold. Or, as Shakespeare put it, the more love you give to others, the more you have, for "both are infinite." (Romeo & Juliet, II,ii). This is something of the meaning of this card. The more love and good emotions that you put out into the universe, the more come back to you until you have a feast of good wishes. Think of it like walking into an inn and finding that the innkeeper has already filled his chalices with the best wine for you and your friends. The reader can predict for the querent satisfaction in family, friends and relationships, joy and camaraderie. They will feel creative and happy. In addition, this card could be a prediction of a great dinner, an amazing party or just a wonderful night at the local pub. 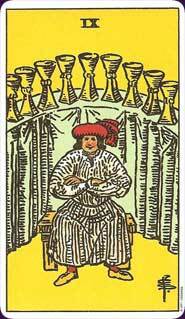 Learn the Nine of Cups tarot card meaning and the rest of the card meanings, symbols and stories in our eBook.